We have finally hit the stretch of this bathroom renovation where visible progress. Once we got beyond the hurdle of demo & plumbing, it was finally time to start tiling! I partnered with Jeffrey Court to create a phenomenal design in this small master bathroom. 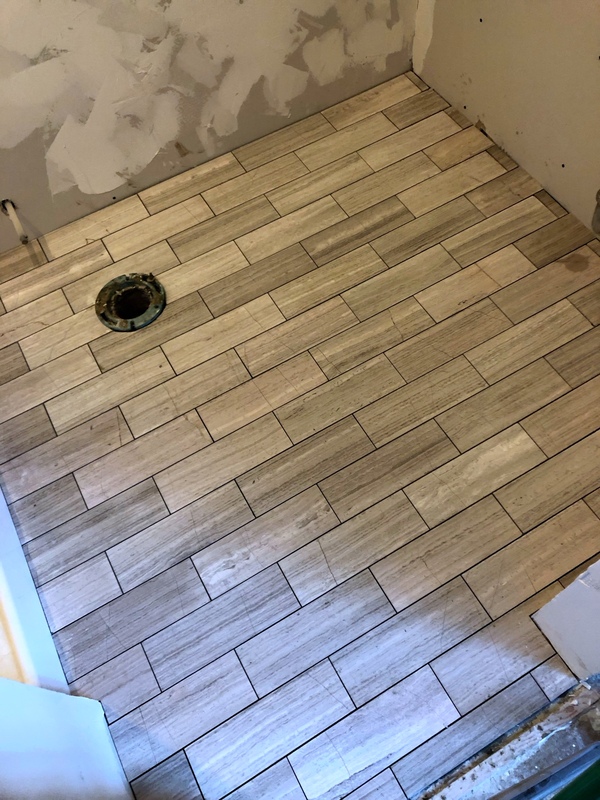 I finished Week 3 with the shower set, floors & drywall prepared and the tile was delivered! This is where it gets fun folks! I’m a firm believer in choosing neutral colors but statement design for flips. It’s okay to have fun and create beautiful spaces, but keep in mind it needs to appeal to the masses. I chose a neutral, muted gray tone for this bathroom, but the tile is really the statement piece in this room. I wanted a luxurious feel in this bathroom, so I purposefully chose products that offered design, functionality, and beautiful finishes. Jeffrey Court’s Stone Grey Limestone has luxurious design and an incredible detailed finish. While I was tempted to utilize the herringbone pattern again like I did in my Jeffrey Court sunroom makeover, I didn’t want the space to feel overly busy since it was a small space. And while the limestone tile floor is beautiful, I knew this tiny bathroom needed to make a huge impact to buyers. And while a painted accent wall can create a design impact, there is nothing like a phenomenal floor-to-ceiling wall to create a dramatic impact. I chose Jeffrey Court’s Fiore Ceramic Tile. The tile has a beautiful design with a dimensional textured finish. 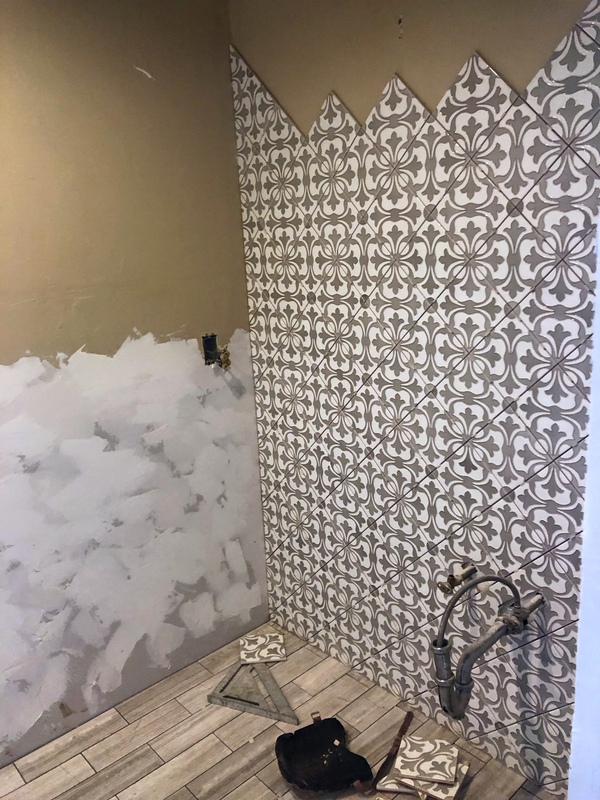 After seeing the tile installed on the wall, I started getting so incredibly excited about this design! 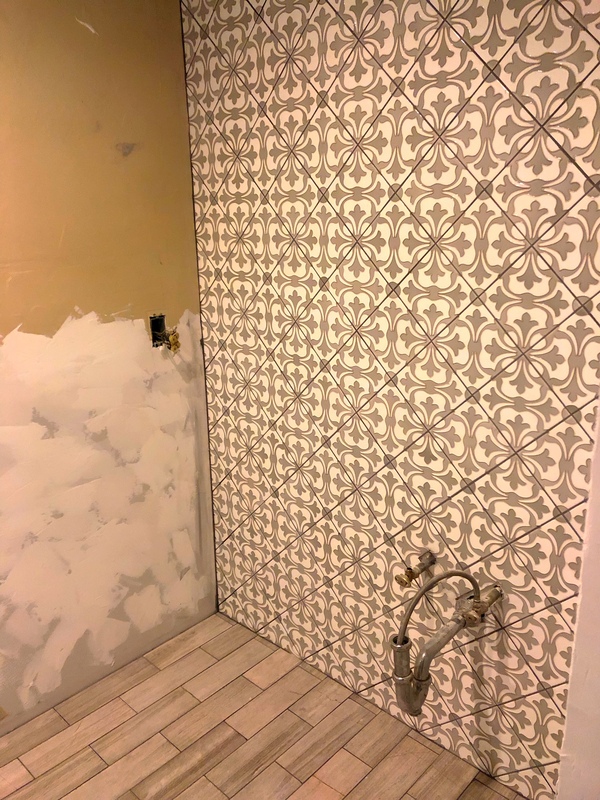 During Week 4, the only project I accomplished was the tile- but it’s definitely the best project so far, right? There’s a myth that if you flip houses and use neutral colors, the design is diminished. However, with this little bathroom, I want to prove that myth wrong! And with this absolutely stunning Jeffrey Court tile, I think I’m heading in the right direction! Next week starts final installs of the toilet and vanity, and the walls will get painted. This project has had so many hurdles, but it’s definitely one of my favorite bathroom renovations!